Blue Sky Fund brings youth from all over Richmond, Va. together through outdoor adventure and service. Rising ninth through twelfth graders spend a few days learning wilderness survival skills like how to set up a tent and light a stove before embarking on a week-long trip to the Grayson Highlands and the summit of Mount Rogers, the highest peak in Virginia. Although she had previously hiked with her dad, Sjovold said she had never done a multi-day trip this long and strenuous with a group of people she had never met before. The students learn to navigate each other’s strengths and weaknesses while out on the trail, taking on different roles each day. But the program doesn’t end after those two weeks over the summer. The boys’ and girls’ crews come together to meet throughout the school year, volunteering one Saturday a month in urban gardens, parks, and homeless shelters around Richmond. Although Ahmad had participated in Blue Sky’s afterschool program through the local Boys and Girls Club, he wasn’t as sure about signing up for the backpacking trip. At the encouragement of his grandmother, he applied for the institute and went on the trip the summer before he started high school. Bly Sky Fund’s Outdoor Leadership Institute students are nominated by a teacher, mentor, or alumni of the program and then interview with the program directors. For the students selected, payment is based on a sliding scale to give every student the opportunity to participate. Starting in the summer of 2019, Blue Sky will accept up to 40 students for four summer sessions. “We try to get a diverse range of students from different backgrounds because when we’re talking about race, leadership, and unity in our communities, it’s really important for them to learn some new perspectives,” said Program Manager Dustin Parks. The students build the foundation to have those honest conversations through outdoor adventure and teamwork. Once students finish the year long program, culminating in a graduation in June, they are invited to join alumni trips the following summers to continue building that self-confidence and sense of accomplishment. With these trips, the students have more control over where they go, learning how to plan, budget, and execute a trip of their own design. Blue Sky provides them with the funds, transportation, and facilitators to make it happen. After his hesitation about the initial trip, Ahmad was all in on the alumni trip. The group biked from Pittsburgh, Penn., to Washington, D.C. along the C&O Canal and Great Allegheny Passage. Similarly, Sjovold found she still wanted to be involved with Blue Sky but could not make it on the alumni trip. During the summer of 2018, the program managers invited her to work as a guide in training. The support from the program leaders extends beyond the institute itself. The Outdoor Leadership Institute is only one part of Blue Sky Fund’s mission to engage more students through the outdoors. The organization partners with eight Richmond public elementary schools, working with second through fifth graders on experience-based science instruction. They lead after school adventure clubs at ten locations throughout the city for middle schoolers. Over the summer, Blue Sky offers a six-week camp to expand on the programming they offer during the school year. A full day of camp gives them more time to take the students to places outside of Richmond, including an overnight camping trip each week. The summer program costs $10 per week but the program works with each individual family so that cost is not a barrier. With all Blue Sky’s programs, most of the funding comes through donations, grants, and private partnerships to reach more children through the outdoors. Brittany Bailey started working with Blue Sky Fund as an intern in 2013 before coming on full time in 2017. As the adventure program manager, she works with students across all grades and heads up the summer program. 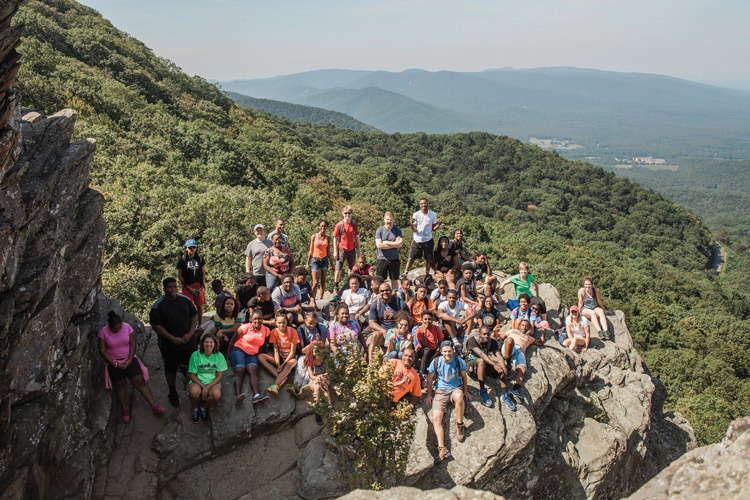 Each week, the campers learn various outdoors skills such as paddling, rock climbing, Leave No Trace principles, and first aid, venturing out to George Washington National Forest and Shenandoah National Park. For college students, summer is a time for learning the skills needed for after graduation. Whether it’s through a job, an internship, summer classes, or study abroad, it’s an opportunity to explore. The Greening Youth Foundation started as an environmental education program, partnering with public schools in Gwinnett County, Ga. to teach students about nature and wellness. 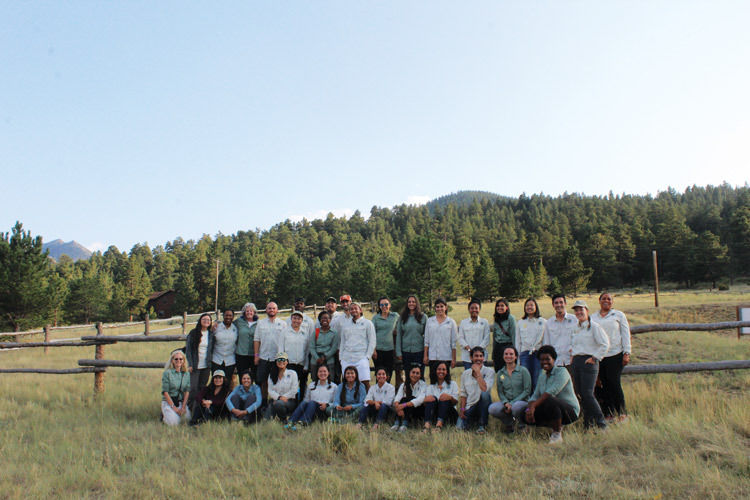 As their mission evolved and grew, the foundation began partnering with the National Park Service, USDA Forest Service, Bureau of Land Management, and several outdoor retailers to offer internships for diverse and underrepresented students among the next generation of environmental leaders. Eboni Preston, the director of programs, said these partnerships present an opportunity for young adults to gain experience in the field and build professional networks. They place around 500 students in a variety of positions every year. Students apply through the foundation which then works with the partner organizations to match students with positions and parks. Once students start their internship, the foundation is there to provide support throughout the experience. In addition to summer internships for undergraduate students, there also longer internships available for graduate students. At the end of every internship, Greening Youth asks the students to submit a multimedia reflection piece about their experience. While studying biology at Spelman College, Cristha Edwards worked with the Atlanta Botanical Gardens for two years as a conservation and biology intern through the foundation. During the summer, she worked full time in the molecular, tissue culture, and GIS mapping labs. Now, Edwards is working with the foundation and the Forest Service on a faith-based forestry program at Proctor Creek while she pursues her Master of Divinity at Emory University. Through it all, Edwards said the team at Greening Youth Foundation has been there for her. Free Forest School is not a summer program as the weekly meet ups happen year-round. And it’s not a camp. But it’s a chance for children to spend some unstructured time outside, engaging their sense of wonder at a very young age. It caters to families with children from newborns to six year olds. Forests schools are not a new phenomenon. This style of learning encourages people of all ages to interact with the world around them, promoting independence and creativity. But unlike many outdoor programs for young kids, Free Forest School is exactly that. Free. “We were looking for things to do outdoors with our family here in Baltimore and I just found a lot of the outdoor programs for families with young children were just so expensive,” said Atiya Wells. Wells is a pediatric nurse in Maryland and mother of two. After learning about Free Forest School, she went through the process of starting a chapter when she learned there was not one near her family. The group meets once a week at the same local park, averaging around 12 families. They typically walk between a quarter mile and half mile before setting up base camp. The children are then given at least an hour of free play before coming together for snacks and story time. Since starting the Baltimore chapter over a year ago, Wells said her five-year-old daughter has become more independent when it comes to play. Her two-year-old son, who started the program at an earlier age, is more confident on his feet, climbing hills and rocks without any hesitation. Getting involved with Free Forest School also inspired Wells to enroll in the state master naturalist program through the local extension office. The class has helped her identify plants, wildflowers, and rocks with her daughter when they are at their weekly meetups. Wells also sits on the board of directors to help guide the organization at the national level and promote the accessibility of the program. One of the things facilitators like about Free Forest School is the flexibility it offers depending on location. With dozens of chapters across the country and a handful internationally, it looks a little different in each place. SarahRuth Owens heads up the Southern Blue Ridge chapter with groups meeting in Georgia, North Carolina, and South Carolina. The group she facilitates rotates locations after 12 weeks, giving the children time to learn an area but also experience new places. Owens plans to homeschool her five, three, and two-year-old so Free Forest School gives them a chance to interact with other children, especially her oldest. Owens said her group likes water, so the parents consider how deep and swift the water is when scouting locations. That idea of self-directed play is what drew Matt Jarman and Janice Adelman to the program. The parents of a four-year-old and a four-month-old started a chapter in Rockbridge County, Va. a few months ago. Although the group is still small, they already know this is something they want to continue growing for other families in the area. For decades, campers of all ages have flocked to summer camps around the Blue Ridge Mountains for adventure. Set in the heart of Appalachia, these summer camps offer outdoor experiences for kids and teenagers of all ages. Surround by the Monongahela and George Washington National Forests, Camp Hidden Meadows offers adventure for campers ages 6-16. Spend your summer learning outdoor living skills, farm to table cooking, mountain biking, and more. Older campers have an opportunity to venture further beyond the base camp on one of the Earth Expeditions. 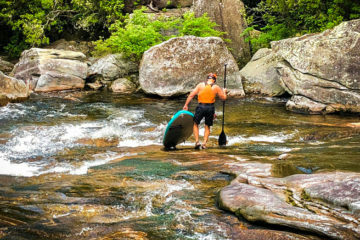 Spend a week backpacking to the top of West Virginia’s highest peak, whitewater raft down the New River Gorge, and climb the rocks at Seneca Falls. With over 3,400 acres to explore, Green River Preserve has plenty of space to explore, create, and learn. During the Mentor Hike, campers explore the many ecosystems of the preserve led by naturalists. 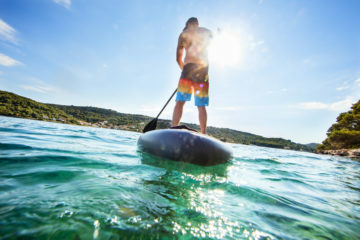 These hikes encourage campers to slow down and connect with the natural world. Rising high schoolers through rising college freshmen are invited to return for one of the graduate expeditions in the Blue Ridge Mountains and Outer Banks. What better place to spend the summer than in the Great Smoky Mountains National Park? Campers build relationships with each other, staff members, and the environment through hiking, camping, and paddling. Explore well known areas like Max Patch and Pigeon River, spend a night in the Lost Sea Caverns, and take a turn on the climbing wall. Each session ends with a trip to Ober Gatlinburg for some summertime ice skating.